Franciscan Wedding Church that stands above the location of Jesus' first miracle. This church contains the stone jar that is thought to be that used by Jesus at the feast. Cana is a historical city, in which Jesus performed his first miracle. In Jesus' first miracle, he was attending a wedding, with his mother. The wedding, which usually lasted a much longer than modern day weddings, came to a halt as the wine ran out. Jesus took the opportunity, after his mother's suggestion, to change the water into wine through a miracle. A second miracle also took place in Cana, when Jesus healed the dying son of a government official. The location of Cana can not be certain but the most commonly believed location is modern day Kefer-Kenna. This is located five miles away from Nazareth, which matches up well with the Biblical claim that Cana was five to eight miles away from Nazareth. There are also other claims and ideas of where Cana may be but Kefer-Kenna seems to provide the most support and backup. In Kefer-Kenna a Franciscan wedding church has now been built on top of the location archeologist believe the wedding feast was held. This church is now a great location for tourists, and for religious worship, while continuing many biblical information of Jesus. Near Cana, stone water jars have been excavated from a site which seem to have been a workshop. This may have been the very place where the Cana wedding jars, in which Jesus changed the water to wine, were created. Cana is still a huge site that archaeologists are actively exploring. A photo displaying the wedding feast where Jesus turned water into wine. In John chapter five, John writes of a wedding that took place in Cana, a city in Galilee. Jesus, his disciples, and his mother were all attending the wedding. During the wedding, while all the guests were celebrating with wine and probably dancing, the wine ran out. In those times, marriage celebrations proceeded through the night and lasted several days. The lack of materials for feasting would be quite significant and disappointing to all who were present. Jesus' mother came to him and informed him that the wine ran out. But Jesus' response and tone revealed that he was unaware of why she told him this. Jesus' also states that his "time had not yet come". This comment somehow seems to be disregarded, and Jesus proceeds to direct the servants. He tells them to fill the jars with water and then draw out the water. Upon drawing out the water, the appearance has changed to that of wine. After the guests had tasted the drink they were sure that it was indeed wine. John 2:11 states "What Jesus did here in Cana of Galilee was the first of the signs through which he revealed his glory; and his disciples believed in him." Stone artifact believed to be a jar used at the wedding feast when Jesus turned water to wine. This video provides educational details and facts about the location of Jesus' first miracle, and an inside view and information about the church that stands over the location of wedding feast. ↑ Cana See the Holy Land. Accessed: January 02, 2018. Unknown Author. ↑ The City of Cana in the Time of Jesus Bible History Online. Accessed: January 02, 2018. Unknown Author. ↑ Jesus Works His First Miracle at Cana in Galilee Bible Study Tools. Web. Accessed: December 13, 2017. Unknown Author. ↑ John Chapter 4 Bible Gateway. Web. Accessed: January 02, 2017. Unknown Author. ↑ Neffinger, Veronica The Cana Wedding Wine Jars Were Likely Crafted in a Cave and Archaeologists Think They’ve Found It Christain Headlines. Web. Accessed: January 03, 2017. 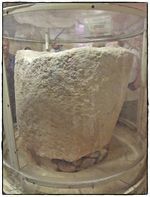 ↑ Archeologists says she's found site of Jesus' First Miracle. MSN. Web. Accessed: January 03, 2017. Unknown Author. ↑ CANA FRANCISCAN WEDDING CHURCH Shalom Holy Tours. Accessed: January 04, 2018. Unknown Author. This page was last modified on 11 January 2019, at 16:32.